Sunglasses can make us look awkward or chic, but their real value lies in their ability to protect our eyes. Since damaged eyesight is difficult to correct, choosing the right sunglasses is key to maintaining good vision and eye health. Most optometry clinics have specially trained staff who can help you select a pair that preserves your vision while helping you look your best. For now, here are a few tips on finding sunglasses that protect eye health. 1. Look for UV protection. Ultraviolet (UV) rays from the sun damage both the skin and the eye's lens and cornea. As optometrists know all too well, UV exposure has been linked to two medical conditions that degrade your eyesight: cataracts and macular degeneration. In addition, UV light can increase the chances of developing skin cancer and cause premature aging in the form of wrinkles and crow's feet. 2. Select the right color. The hue of the lenses doesn't affect UV protection, but it can influence how you perceive colors. Avoid lenses with a yellow or rose tint; these make it hard to read traffic lights. Look for gray, brown or green lenses for minimal color distortion and safer driving. 3. If you love the water, opt for polarized lenses. Polarized lenses decrease glare from reflected light, so they're great for boaters or folks who spend a lot of time on the road. However, it might be trickier to read a GPS device, cell phone or LCD dashboard display. 4. Check for good quality lenses. 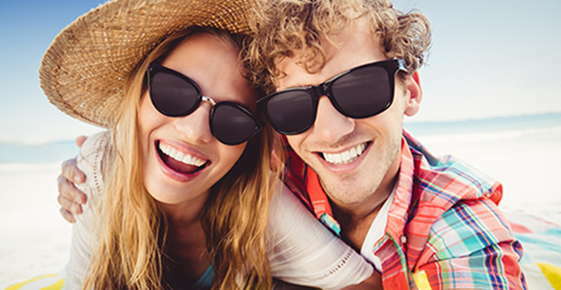 Inexpensive sunglasses can offer the same level of UV protection as higher-end brands, but those with lower price points may have more quality concerns. Whichever end of the spectrum you choose, try on the pair you're considering and focus on a vertical line or edge. Move your head from side to side while keeping your eyes still; your eyes should sweep across the lens. If you see any wiggle in the line, then the lens likely has an optical defect; choose a different pair and repeat the test. American Optometric Association (2013). Sunglasses Shopping Guide. WebMD (2012). How to Pick Good Sunglasses.